Great sports weekend all around. A dominating Steelers victory, the return of hockey, and the firing of Jim Tracy. Beautiful. -Regardless of how you voted in the poll (I'll get to that in a minute), you have to admit the lack of 24/7 preseason coverage of the Penguins and their preseason games adds to the experience of opening night. The almost total shift of hardly any video access to being in the middle of a heated regular season game that means something in the standings can't be touched. We're way too late on any game analysis, so I won't even try, but I thought one thing needed mentioning: is Mark Recchi this year's version of John LeClair? I know its early, but it isn't like Recchi had a sterling second half last year, with only 10 goals in the second half and only 2 in the final 28 games. Before the pressure starts mounting, he better pick up his play. 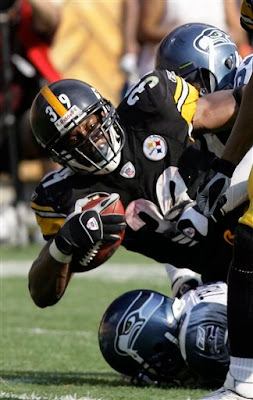 -I don't remember the Steelers' defensive backs ever playing a better game. Just blanket coverage. The frustration Hasselbeck was displaying made it all the more enjoyable. -Even though Santonio didn't play, we were still so close to a "San Antonio" miscall. Joe Buck was commenting on his pregame injury and said "San An...Santonio Holmes...". If Joe Buck starts saying it, we're all in trouble. The vote was a lot more intriguing than I expected, not because the teams were so close, but because the lead shifted 3-4 times after it passed 100 votes. I didn't write it down, but I think the Penguins were leading by almost 15 at one point. An incredible comeback by the Steelers, who eventually won 197-178. What does it mean? Our readers prefer the Steelers this year, but by a slight margin. The key there is our readers. You could postulate that, overall, the gap in Pittsburgh between the Steelers and Penguins in terms of popularity has shortened, and it most likely has, but you can't really say that from our results. I would say it would be safe to assume with a great amount of certainty that the gap has shortened with internet users (read: younger generation). I still think the yinzers 50 and above care much more for the Steelers than the Pens, but again, that's a guess. The only reason I bring up these points is because of a poll by Harris Interactive on what NFL team is the most popular (via Fanhouse). The Steelers came in third, falling from their first place finish of a year ago. The poll, though, was conducted online and the participants had no incentive to complete it. I'm not saying you have to throw the results out, but you have to maintain perspective. The poll didn't answer the question about which team is the most popular among all fans in America, but just which team was most popular among internet users who stumbled onto the survey. Harris admits there is room for error at the bottom of the article, but no one mentions this. It's still an interesting read, and I thought it complimented our poll results well.